Say you're getting married and don't want to invite your parents due to the abuse they visited upon you as a child. And say those same parents are now bullying you for an invitation. What do you do? If you're this bride, you send them an invitation that's so acid-dipped that you can feel the burn from here. 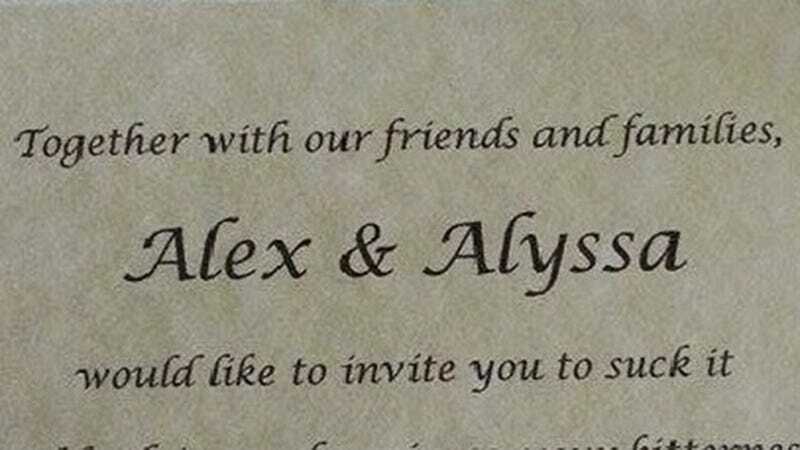 This invitation, created by Redditor Skitzocat and originally posted several months ago (but going viral now, probably due to Valentine's Day) was made in response to her parents' demands that they be included in an event at which they were not wanted. And because Skitzocat's parents are narcissists, there was no way they were going to get the message that they're not allowed (they're uninvited) unless it was sent loud and clear. And damn, was this message serving some pain.